Best Beach Bargain In Mexico? The dollar’s buying power versus the Mexican peso is up over 100% since 2008. Effectively, most everything in Mexico is now selling for half price. Even in those expat areas where real estate trades in dollars, everything else in your life is a major bargain. Your taxes, restoration costs, furniture, upkeep, clothing, car repairs, etc., all cost half what they did just a short time ago. Where you’ll really see the difference is in cities that used to be expensive, places where the costs of fine dining, wine, and entertainment had expanded beyond the typical retiree budget. 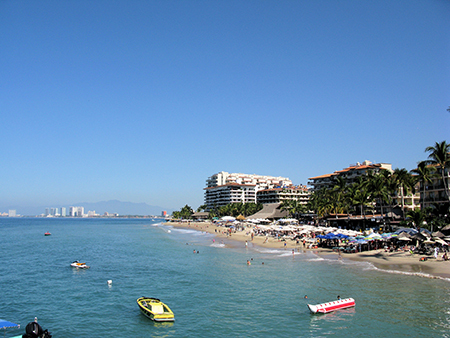 One of the best examples of this is Mexico’s famous beach resort Puerto Vallarta. There’s no better place right now for escaping harsh winter weather than coastal Mexico. 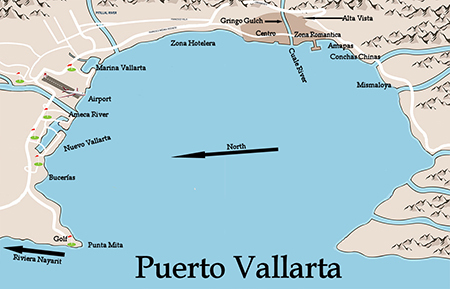 And Puerto Vallarta (known as “PV”) is no exception. Centro offers everything you need within easy walking distance. There are plenty of shops, cafés, fine and casual restaurants, markets, and some of the city’s best nightlife. The long and beautiful El Malecón (boardwalk) begins here and is the hub of seafront life. In the Zona Romántica, I came across an interesting property just down the street from where I stayed in PV. It was a one-bedroom, one-bath condo of 66 square meters (710 square feet) in the La Palapa beachfront complex (which hosts one of the area’s best restaurants). The apartment offers a large, single bedroom with a terrace and island kitchen. The living room has a sofa bed for guests, and the dining area seats four. The complex has a rooftop pool and sundeck, and offers an excellent location in the center of all the action. In Centro, a spacious main-floor unit is available in a quiet, boutique complex with a heated swimming pool, colorful bougainvillea plants, and a view of the city lights and the bay. This 120-square-meter (1,291 square-foot), two-bedroom, two-bath home is well-situated just blocks from El Malecón and is within walking distance of restaurants, shops, and galleries. zPV is one of the most expensive real estate markets in Mexico, so if you’re simply looking for an inexpensive beachfront home, this won’t be the place to buy. Also, Centro and the Romantic Zone are noisy well into the night. This is the price you pay in any city for the convenience of being near everything, but it’s worth a reminder.